To be honest, I was not really looking forward to coming here, the city has a terrible reputation for safety (its only a few weeks since troops were on the streets trying to clear drug barons out of the slums) and I really only came as it was on the way back from my other destinations; it seemed a good opportunity to fit it in. Initial impresions are not that great, the trip in from the airport is quite grim; large parts of the journey being on an elevated motorway through very run down areas of town (the trip in to London from Heathrow is also fairly grim, so I tried to reserve judgment). If you are staying on the southside (Copacabana/ Ipanema) the next part of the journey takes you through a very long tunnel (under the Cristo Redentor mountain) and you emerge in a zone that looks a bit more promising – promising but boring. And I think that sums up my initial problem with Rio; the buildings and the streets are just boring, drab, could be anywhere. The situation of the city is undoubtably outstanding, with the bays, lakes and forests – probably the best in the world; even beats Sydney – but at street level it’s charmless and lacks character. 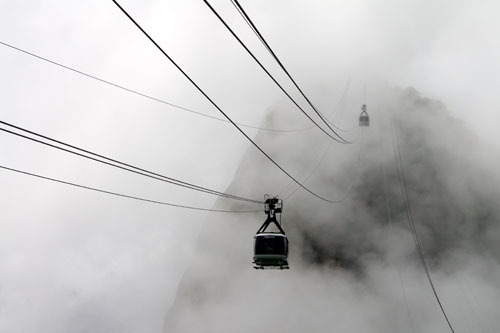 One of the ‘must sees’, Sugar Loaf mountain is ascended in 2 parts; the first cable car takes you to the top of Morro de Urca and from there you can ascend to the top of Sugar Loaf itself, at 400m high you get fantastic views of all Rio (clouds permitting). My favourite fact of the whole trip is about the Sugar Loaf and comes from the DK Eyewitness Travel, Top 10 guide: ‘The first recorded solo climb of the Sugar Loaf was made by British nanny, Henrietta Carstairs in, 1817’… Jolly good job Henrietta; presumably she decided to do this on an afternoon off. 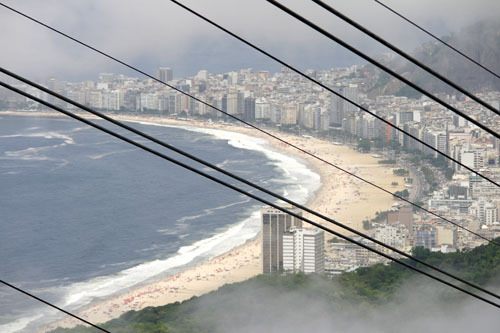 There are a few cafes and shops at both the summit and the half way point, and helicopter trips over the city can be taken from the Morro de Urca (half way point). The cafe at the top of Sugar Loaf gets a special mention for the staggering rudeness of its cashier, the incredible complexity of its till systems and the stupid system whereby you have to tell the cashier what you want, get a receipt and then go and attract the attention of a member of barstaff to get the goods. I know this system is used elsewhere (Italy favours this a lot), but how stupid to expect tourists to be able to describe what they want, especially at a location that will attract a lot of non native speakers. 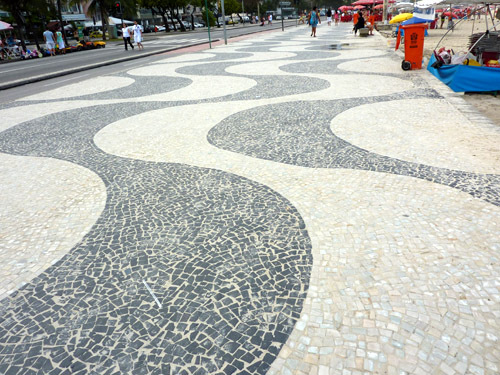 If you book a tour to Sugar Loaf Mountain they will often include a side excursion to the Cathedral de Sao Sebastiao. 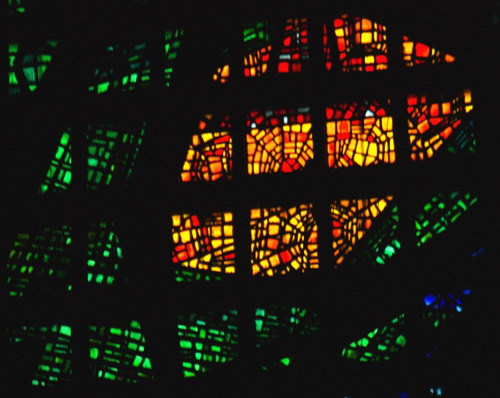 Despite the fact that once inside there are some rather nice stained glass windows, this is the most hideous building I have ever seen. It looks like an incinerator and if it serves any purpose at all, it is to remind us what a load of old crap much of that ‘brutalist period’ of architecture was back in the 1970’s. 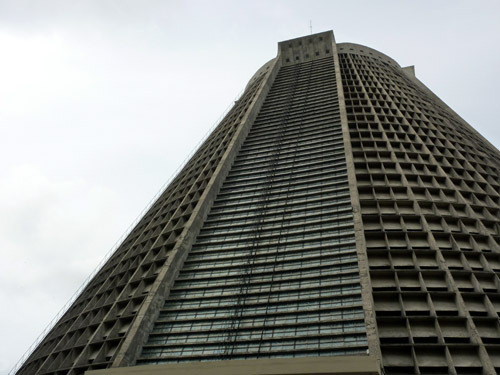 I am not against modern architecture; quite the opposite, if you want to see what can be done with concrete visit Valencia, but this building is simply atrocious. 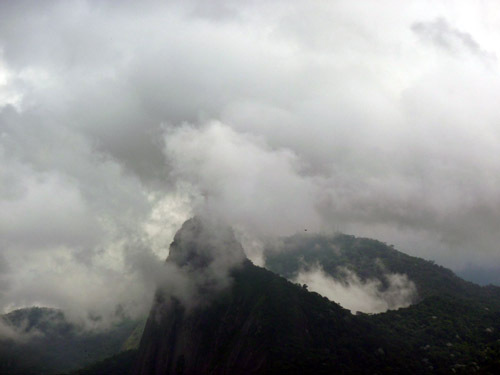 There are a couple of options for ascending Corcovado mountain: you can drive or take the train; take the train out of preferance as the journey is almost as good as the destination. The Trem do Corcovado is a funicular railway, which opened in 1884, the ascent is quite steep in parts and the journey takes about 15 minutes. 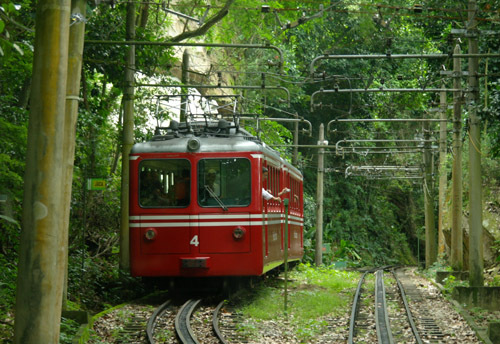 The route takes you through the tropical rainforest of Tijuca, which at some 37 sq km is the largest urban forest in the world. 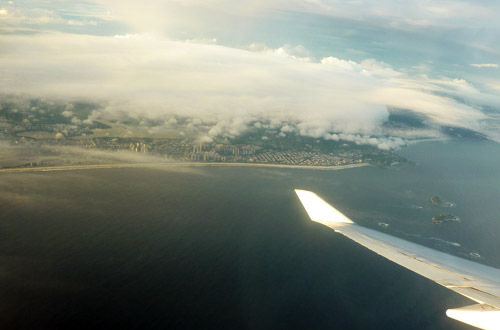 Apparently there is lots of resident wildlife – you are unlikley to see any – but the trees and greenery are pleasant, occasional breaks give good views over Rio. 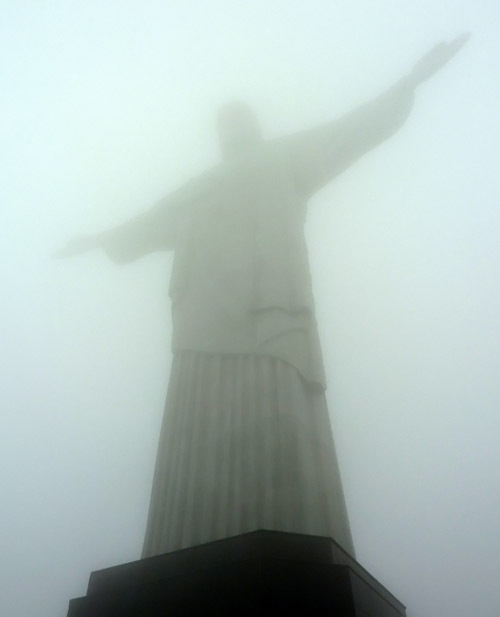 Unfortunately, the top of Corcovado was wrapped in low cloud the day I visited, which was a shame as I was looking forward to seeing the statue up close; apart from its iconic status, I do think its a very elegant statue. Inaugurated in 1931 it is partialy a design of its age (deco), there are clear influences from da Vinci’s Vitruvian Man and the proportions are all wrong; but that’s why it works. 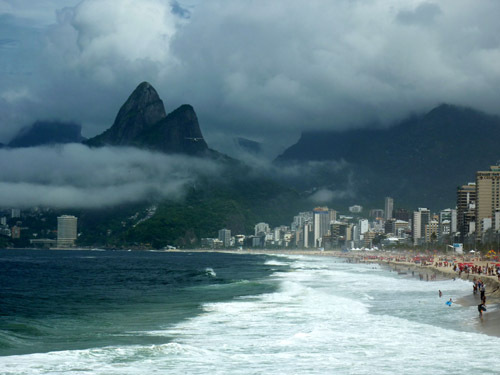 Of the two main beaches Ipanema is the more upmarket, both on and just off the beach, the streets at the back of Ipanema have the best bars and restaurants. There are surprisingly few beachfront bars and restaurants, apart from the kiosks, most of the bars are a block or 2 back from the front. 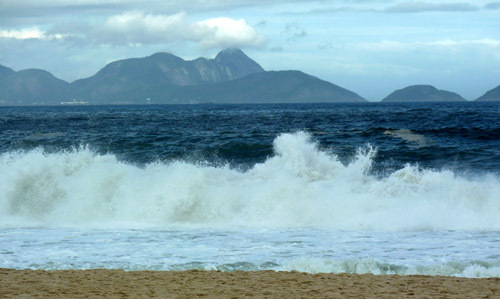 The waves are quite fierce at both Ipanema and Copacabana, and probably not ideal for swimmers; there is quite a bit of surfing, especially at Apoador, which is on the headland between Ipanema and Copacabana. Also, the water is quite cold. On Sundays, the beach side carriageway of the road is closed to traffic; this allows maximum posing opportunities for joggers, skaters, walkers etc. The opportunity is taken to the full and I noticed a very strange kind of running technique where a a lot of effort seems to be going in, but not much progress is made; I suppose this allows for maximum viewing time. There is a fair amount of care in the community wandering about as well – several times someone stopped to shout a stream of opinion about something or other (no idea what), and at one beach side bar a woman was wandering about in deep conversation with someone; someone not visible to the rest of us… oh well, seemed harmless. Plenty of police in evidence although it all seemed fairly peaceful. 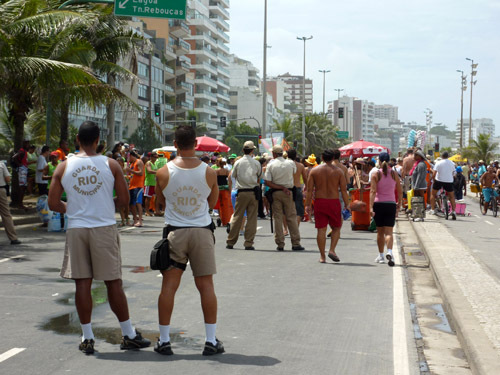 Copacabana beach has become a bit tatty of late and is particularly noted for its dangers after dark – sometimes in the day too. 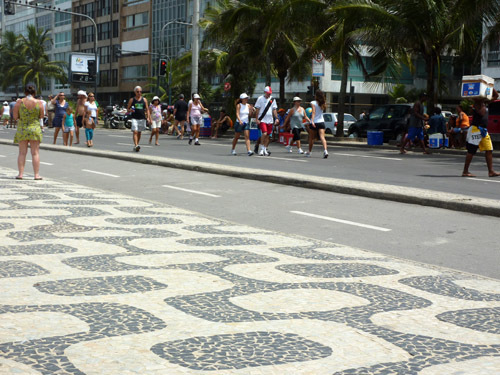 The beach side promanade is in the Guinness Book of Records as being the largest art work in the world – some 4 km long. There is work going on to build beach side centres; cafes, toilets etc, so this might improve the reputation if they take off. Maybe I was unlucky, but I only had one meal that was good, the others varied from adequate to bloody horrible. They do seem to like salting stuff and I’m just not used to that level of salt. On the day trip the lunch served was terrible: a battered fillet of fish that was oversalted and cold, served with a few spoonfulls of mixed cold rice and veg – completely devoid of any flavour other than salt. Another evening meal I had (at what looked to be quite a smart place) was described as ‘fillet of pork with pepper and tomato salsa’, what actually came was 3 pork loin chops salted and grilled to the consistency of cardboard, surrounded by bits of chopped up green pepper, some quarters of a huge tomato, 2 fried potatoes (whole potatoes, huge – baking potato size), some lettuce, and pride of place: ham and peas. Now, I like ham and peas, but this was just that; a square slice of processed ham with some of those gray green bottled peas chucked on. The whole thing was served on a silver salver and whilst they seemed quite pleased with it, to me it looked like someone had just emptied the kitchen bin on to the plate… somewhat lacking in finesse. You will need to watch the prices too, most starters at the above restaurant were in the £5 range, I was going to have the melon and ham when I noticed that it was £15… bloody hell, £15 for melon and ham. The good meal was at a place called Opium, fusion/ oriental, this was excellent and the staff were friendly and knowledgeable. 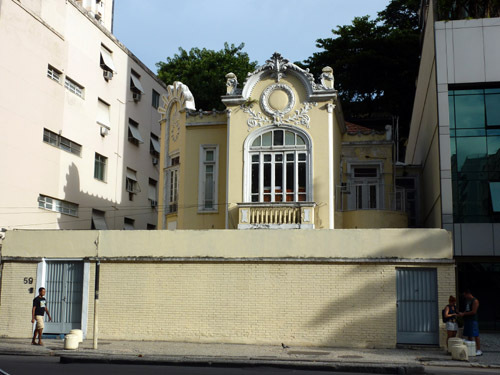 (Corner of R Prudente de Morais and R Farme de Amoedo). Snack food is often strange, there are breakfast/ juice bars all over town that sell croissants and other roll type offerings, but they are all ‘messed with’, it proved almost impossible to get a plain croissant, they were all stuffed with cheese, chicken or some other meat – odd… I would recommend the acai though, lots of cafes sell this as a semi frozen slush, you add fruit or cereals as you see fit and it tastes great – be careful to specify if you don’t want sugar. I had no problems and if you are sensible you should be OK. Stay with crowds, stay in well lit areas and if you feel uncomfortable head for a bar or restaurant and get them to book you a taxi to your destination. There is no reason to be in most of the more dangerous areas, eg: downtown after dark, so don’t go there. 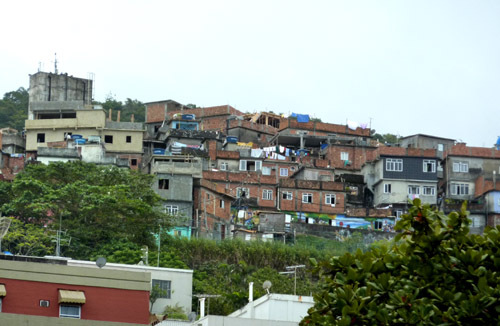 Similarly the favelas should be considered completely off limits, a large part of the population lives in these areas (there are over 240 listed Favelas), but you will stand out like a sore thumb. Be wary of ‘invitations’ from people you don’t know, a current scam is drink drugging people after befriending them, they then clear your hotel room out! Most residences, apartment buildings etc, take security seriously and almost all of them have high gates and fences, often with a guard, so that tells you something. One problem is that you can find yourself in an area with poor lighting and lack of activity; as mentioned before, the beachfronts have surprisingly few bars so walking through these areas can leave you exposed. It was on a stretch like this that I felt I was being followed, so I moved to the otherside of the road and then changed direction – I’m fairly sure I was correct as the follower looked a little exasperated. Incidentally: if you hear a beeping noise and a garage door opening, get out of the way. Some of the slopes to underground garages are very steep and when the car comes out its like a rocket launch pad… the driver must have virtually no visibility of the pavement ahead. I can’t say that I fell for Rio and its not on my revisit list, I don’t feel comfortable in a place that is potentialy so dangerous, and I do like cities to have some heritage on display. The setting is superb, but you can’t see this from the ground and at that level its just characterless. If the buildings are boring, the people are not, the streets are full of people whizzing about on skateboards, bikes, jogging, power walking and so on; and age seems to be no barrier to getting on with things. 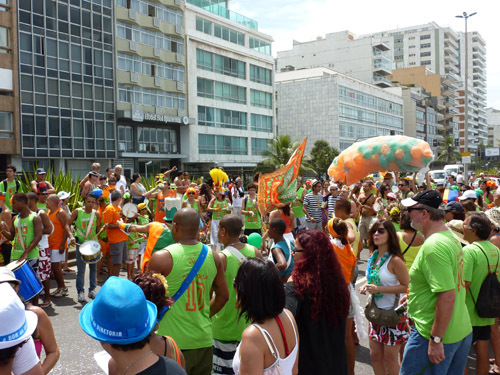 Perhaps if Rio has a character, its not in the setting or the buildings, its in the people.